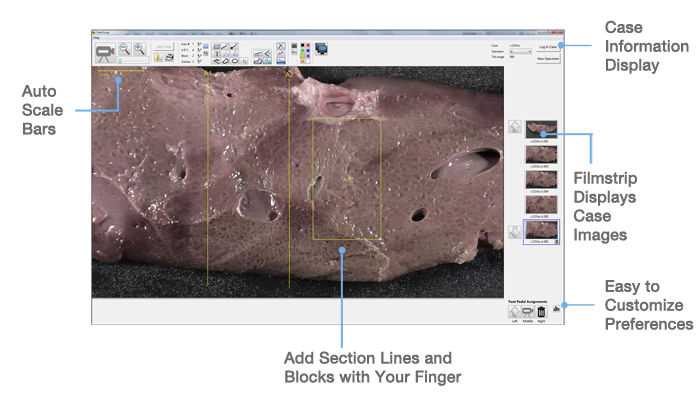 The PathStation macro digital imaging system makes it easy to capture, annotate, measure, share, and save high quality images of gross specimens in the frozen section room. Its fully enclosed HD camera and touch screen monitor take up minimal workspace in your grossing station. 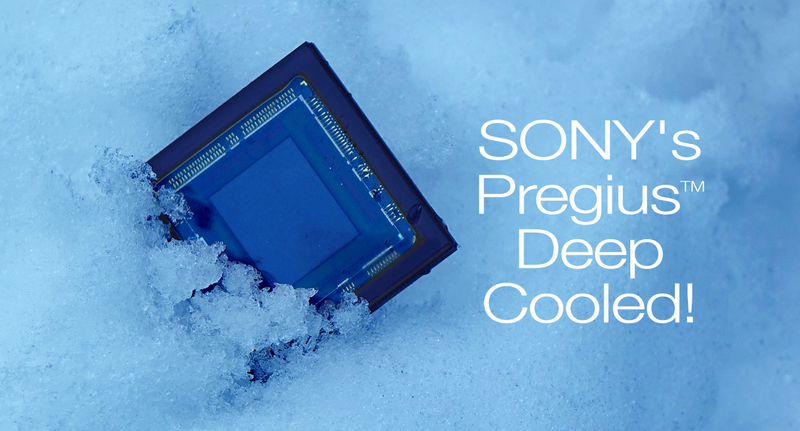 Automatic focusing makes it simple to get crisp, detailed pictures. De-gloving is unnecessary because the system can be controlled hands-free with the foot pedal. Barcode scanning facilitates sample tracking and quality assurance. 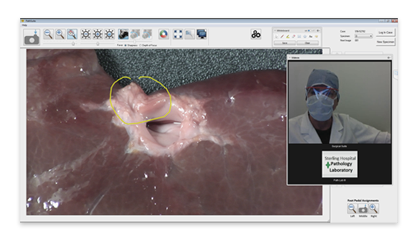 Seamless remote conferencing enables high resolution live consultation with the operating room for interoperative consults. Annotations and scale bars can be added automatically upon image capture, taking no time at all. 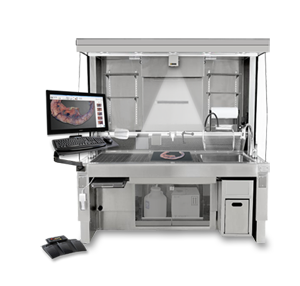 The PathStation adds digital imaging without reducing your case throughput. The PathStation comes with everything you need to add image capture to your grossing process without workflow disruption. Case numbers are scanned in with the bar code scanner. The camera displays live video at 30 frames/second at HD resolution, and can be controlled hands free with the foot pedal. Annotations can be added with a gloved finger on the touchscreen computer. 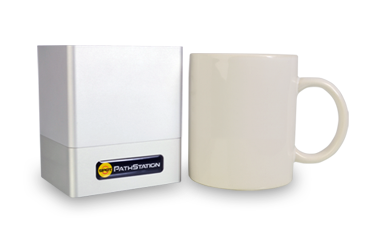 The PathStation is a turnkey system thoughtfully designed for optimal productivity. The PathStation HD camera can be added to any brand of grossing station, including those from Mopec®, Sakura and Thermo Scientific. Since the camera is only about the size of a coffee cup, minimal workspace is used. The PathStation camera is fully enclosed in aluminum, so it’s easy to clean and impervious to ink spatters and other contaminants. The keyboard and mouse are sealed, and the support brackets are made of anti-corrosive stainless steel, just like your grossing station. Industrial construction means this system will be in use for years to come. The new PathSuite™ 2 Software was designed with feedback directly from pathologists, pathology assistants and IT professionals to optimize workflow. The interface is packed with useful features for the frozen section room, but its One-Click Plus™ design keeps it easy to use. On-screen block and section lines, freehand drawing, annotations and measurements are a snap to add with the simple touch-screen interface. Images can be transferred directly to your LIS system or saved to your file system. 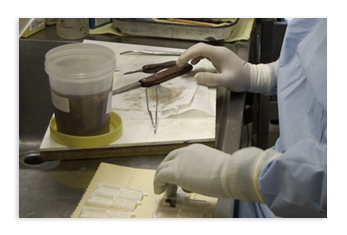 Images from the grossing room can be live streamed at 1080p resolution, providing pathology consultations with incredible detail to facilitate greater diagnostic accuracy and reduce turnaround times. A review of published studies indicates that video conferencing support of intraoperative pathology consultation contributes not only to improved patient outcomes, but also reduces liability and results in significant time savings for the hospital, pathology lab and surgical personnel.